Powers/Abilities: The females of the Badoon possess peak human to enhanced human strength, and they have razor sharp claws. They are green, scale-skinned, humanoid reptilians and are oviparous (egg-laying). They are covered by thick body hair. Traits: The Badoon Sisterhood, unlike the males, are a peace-loving race. However, they hate the males of their species, almost as much as the males hate them. While they are fiercer and stronger than the males, they lack their cunning and slyness. Once in the life of a Badoon, they are overcome by the mating urge, during which time they degenerate into savage, violent creatures. When the urge is consummated, they return to their old personalities. (Defenders I#28 (fb)) - The Badoon evolved on Swampworld millions of years ago. They are older then the Kree and the Skrulls, but they technological maturity much later due to an inborn genetic defect. The male Badoon hated the female--and vice versa. The result was an ongoing, brutal war of the sexes. Mating was accomplished only through force. Progress of any sort was impossible. The males, though cunning, eventually enslaved the females, forcing them to work in unskilled labor, while the males set about evolving a technology. Over a few thousand years they progressed from spears to spaceships. Eventually, the males left Swampworld behind, resettling on another planet, Moord. The males returned once each sun cycle, in giant space arks, bearing those whom "the madness" had stricken, to propagate the race. When mating is done, the males remained to collect the eggs, and then transported them to Moord, where they were hatched in incubators. The males had neither the desire nor the biological inclination to rear the female offspring, and so these were returned to Swampworld, to perpetuate the Sisterhood. (Defenders I#27, 28) - During a mission against the Badoon males, the Guardians of the Galaxy and the time-traveling Defenders had their teleportation beam split, sending them to a number of planets. 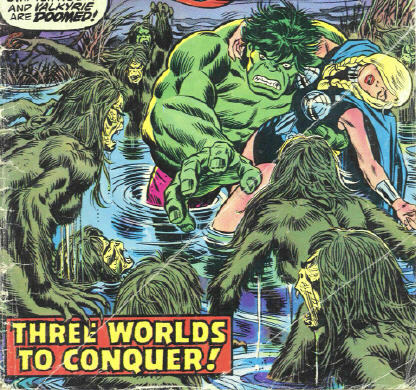 Vance Astro and the Valkyrie arrived on Swampworld, where they were attacked by a number of females suffering from "the madness." 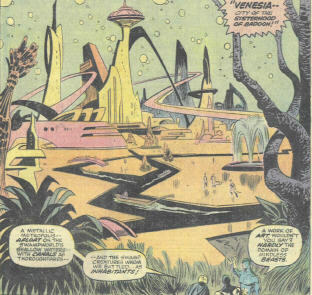 After fighting the savage females off, Vance and the Valkyrie encountered Starhawk, who led them to Venesia. There they met Queen Tolaria, who explained to them the history of the Brotherhood and the Sisterhood. However, the Sisterhood had no idea of the conquering actions of the Badoon, which she learned from the two visitors. (Marvel Presents#3) - As Humanity, led and inspired by the Guardians of the Galaxy, overthrew the Brotherhood of the Badoon on Earth, Starhawk summoned the Sisterhood to Earth. The Sisterhood, led by Tolaria, removed all of the males from Earth. It's not clear whether they took them all back to Swampworld or to another location. Comments: Created by Steve Gerber and Sal Buscema. The Badoon Sisterhood have only shown up in the future timeline of the Guardians of the Galaxy, @ 3000 AD. However, the Brotherhood of the Badoon is known to be active in the modern era in the Earth-616 reality, so it would seem very likely that the Sisterhood is present in the modern era as well--they just have not yet been encountered. Given that the Badoon in the modern era are a star-faring race, the separation of the males and the females must have already occurred. Defenders#28 lists Swampworld in the Capella System, second from the sun. The OHotMU: Appendix to Alien races entry for the Badoon lists the Star System as Lomora. I think this can be explained by placing Moord (home of the Brotherhood of the Badoon) in the Lomora system, and Swampworld in the Capella system. Alternatively, Lomora and Capella may be two alternative names for the same star system. I can't remember who requested this profile...it was over six months ago. Whoever it was pointed out the use of anagrams in the Badoon. The adopted planet of the Badoon males is Moord, and one of the Badoon males is named Droom. The name of Swampworld is Lotiara (as revealed in the OHotMU), and the queen of Swampworld is Tolaria. Queen of the Sisterhood, she dwells in the Palace Royal in Venesia. She has some past history with, and a trust for, Starhawk. She led the delegation to Earth that removed the Badoon males.